Hi guys! Well my mom was embossing cards for our card class in Akron later in April and I saw what she was doing and thought it would be perfect for my card this week! The Cuttlebug embossing folder just sets off the cream Canvas Corp card ~ no additional back ground layer needed here! 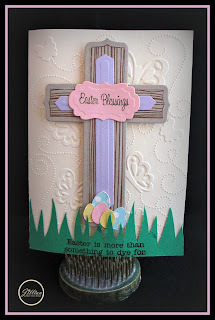 A Jillian Vance Design Peepster Stamp Set ~ for the Easter is more than something to dye for. Plantin Schoolbook for the grass. Very pretty card. I love the saying and die you used.